After Noodles started showing some strange behaviour, he was diagnosed with hydrocephalus, a potentially dangerous brain condition if left untreated. After several attempts, Noodles was successfully treated with surgery. Read more about his case study. 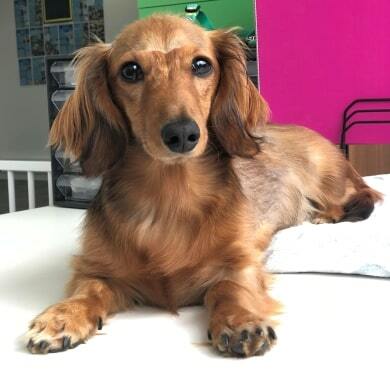 Noodles is a long-haired dachshund who first presented to us when he was 25-weeks-old as his owners noticed various symptoms including yelping when lifted, impaired vision, some hind feet clumsiness and abnormal circling behaviour. These clinical signs were progressively getting worse over the course of 2 weeks. Conducting a neurological examination, our clinicians suspected the problem to be in Noodles’ forebrain. After ruling out any liver issues with a blood test, a brain MRI revealed that he was suffering from hydrocephalus, a condition where excess cerebrospinal fluid accumulates in the brain, and, if left untreated, can cause severe disability, even death. Occurring in many different species including humans, the cause of hydrocephalus in dogs remains relatively unknown but is likely related to ventricular system occlusion during foetal development. This problem is not uncommon in small dog breeds, and not all who have the condition present with clinical signs. To help drain some of the excess fluid from his brain, Noodles was first treated with cortico-steroids tablets. 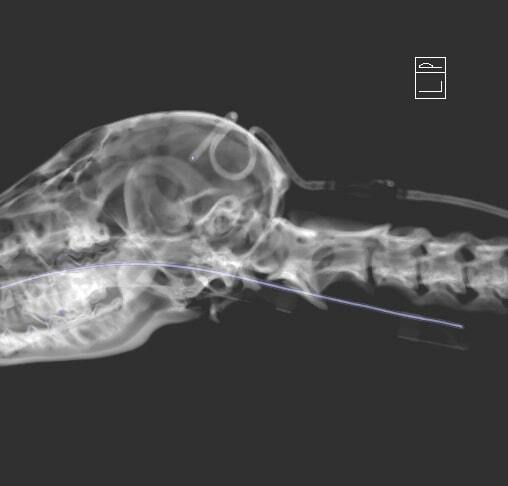 Initially he responded to drug therapy, however after 3 weeks Noodles progressively relapsed at which point his owners opted for surgical treatment. The surgery included placing a ventriculo-peritoneal shunt (hole or passage) into Noodles’ right ventricle, which then drained the excess fluid through a silicon tube under the skin along the neck and thorax into his abdomen. This treatment is highly similar to that performed in children with the same disease. Noodles recovered from the surgery and returned to his normal self until he represented to U-Vet five months later with fever. The neurological team working alongside the emergency service established that he was suffering from abdominal infection (peritonitis). Given that his shunt was connecting his abdomen to his brain, it was decided to remove the device to prevent a brain infection. It is quite common for ventriculo-peritoneal shunts to fail at some point either by the tube disconnecting or an obstruction caused by a mild inflammation in the ventricle. In this case, shunt infection is considered the worst possible complication and may lead to death if not addressed quickly. Following the surgical intervention to clean his abdominal infection and remove the shunt, Noodles condition gradually improved but his neurological function did not return to normal. After another period of deterioration, it was decided to implant a second shunt in his other ventricle two weeks after the removal of the first. Thankfully, the placement of this second shut was successful. Noodles is now back home and doing very well with his owners. Find out more about our neurology service or contact us.